“I’m more relaxed now.” I’m finally enjoying the game.” I’m smarter now.” I feel the ball better than I ever have. I know what my strengths are and don’t beat myself up when I miss.” “I am convinced that my best day today would beat me on my best day when I was playing full time.” These are all responses from current ranked adult players answering my question: “Are you a better player now than when you were young?” What pearls of wisdom can all competitive players draw from the above responses? There are a number of reasons why players seem to perform better over time. 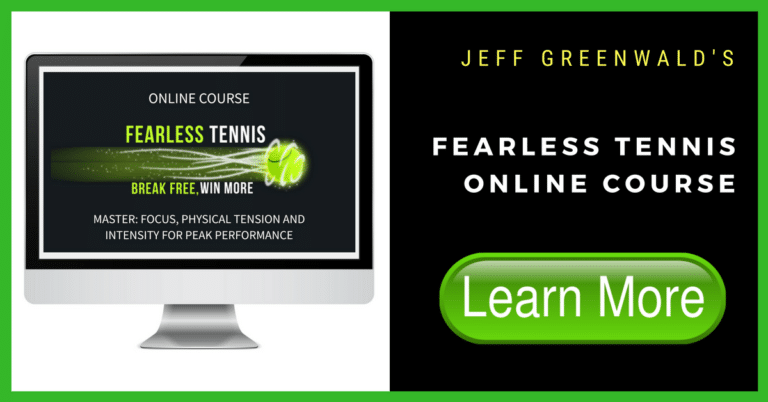 Playing tennis with loose muscles is perhaps the single most important aspect of peak performance. With age, players develop a wider perspective around winning and losing. Results, though still important, don’t carry the same threat as they once did. Therefore, players begin playing more relaxed and tend to go for more. Based on my observations in tournament play, players seem to develop more creativity in their games. There is more of a willingness to take risks and miss. This creativeness and looseness translates into a highly enjoyable experience and is reinforced as players begin to also play better as a result of this mental approach. Ranked juniors and league players could learn a great deal from this wider perspective and relaxed approach. Of course, this is “easier said than done”, as one of my young clients constantly reminds me. But this can be learned and simply needs to be trained in practice and competition. The benefits are tremendous. My suggestion is for players to begin visualizing tight matches during practice and playing specific game scores in which they often have difficulty. For example, a player who tends to get ahead in the game (30-0) and often lets it slip away should practice playing from 30-0 and closing the game out. Similarly, you can also play games in which the first player to reach 30 first in a game wins. Research conducted by the USTA shows that players who reach 30 first in a game win the game 84% of the time. Basically, build in pressure as best you can and commit to playing loose regardless of the situation. Force yourself to go for your shots, within your range, no matter what. A more relaxed approach, with loose muscles and a wider perspective on winning and losing may give your game the shot in the arm it needs. If you’ve read some of my other articles you may begin recognizing my philosophy of peak performance. Playing well consistently requires an absolute absorption in the process. The qualities that comprise the zone—focus, fun, relaxation, low arousal, positive energy, etc. cannot happen without a complete focus of the mind and body in the process. Over time, players learn to cherish the experience of competition as much or more than the result. They appreciate their skills and relish their opportunity to still compete at a high level. This is quite a contrast to many of the young junior and recreational players I have personally worked with and observed over the years. Many of these younger players need to begin translating this concept of “process”—that is, focusing on performance (shots, mind-set, fun) and letting the results happen. This shift is essential. It’s not that older, more experienced players don’t want to win. This is not the case. Often, they want to win badly. But this focus and line of thinking is superseded by the joy of competing. We hear about this concept constantly. “I just put it into perspective.” “It helped me gain some perspective.” “He just has no perspective.” What is perspective? Essentially, perspective is a way of thinking about something. For example, at 5-5 in the third set do you see this as fun, as an opportunity? Or is it a threat and scary because you might lose? It is your choice. And this is the point of this article. We choose how we want to think. We decide what our perspective is going to be in any given situation. As I mentioned earlier, more experienced players who have some years behind them finally recognize the power of this choice. Players begin to realize they can control how they think and what they feel. Players develop a greater sense of control as a result of this emotional development. Control leads to greater feelings of confidence and ability to focus. This translates into more creativity on the court, shot selection, depth and pace in many instances. Sometimes we have to generate perspective even when it’s not there. In other words, using perspective becomes a tool. It doesn’t need to be something that simply develops over time. When it’s windy and we’re down 5-2 in the third, we realize it’s just a match, life does go on so why not go for broke and have some fun? So we let go and begin playing better than ever. Suddenly, we turn a nightmare day of tennis around simply because we recognize how much pressure we have been putting on ourselves. We relax, let go and take some risks. 5-2 becomes 5-4 and suddenly your opponent begins to feel the heat. The tables turn. Momentum shifts. It happens quicker than you think. A little perspective can go a long way in this game, particularly when it loosens you up. Begin feeling what it is like when you are truly relaxed and focused on the court. Alternate between various tension levels when you are on the court to feel the difference between tension and relaxation. Develop some more awareness. Cultivate more perspective at difficult times in a match and place the emphasis on getting absorbed in the process, one point and shot at a time. “It’s a cliché,” said Todd Martin, but it works. Also, begin appreciating your physical gifts and the opportunity to compete and improve. Every day is a new opportunity to hone your game. Stay loose, take risks, and have fun. Learn from those who have gone ahead of you. Why reinvent the wheel? This will all translate into better performances.